Recently I listened to the Wanderer leitmotif from Wagner's Ring cycle. I was both impressed and perplexed by the motif's harmony. The picture below tries to explain the possible modulations that this motif implies. It's quite pedantic, since I think most perfect cadences weren't necessary, but I wanted to establish the tonality and then modulate to a new key center. oTr is the chord that's relative (r) to T minor (o=minor and T=tonic). To explain it more accurately, the oTr chord of D (major or minor) is F major. oSr is the same as oTr, where S stands for subdominant. For example, the oSr chord of C (major or minor) is Ab major, i.e., the relative key of F minor (IV of C minor). Lastly, as I haven't found the above symbols elsewhere except in my Harmony textbook: are there any equivalent symbols to describe these chords in the international music bibliography? "is it called chromatic mediant in English?" Yes; although the term "chromatic mediant" can mean a few chords, this chord would be one of them. Some theorists (like David Kopp) would call this an "upper sharp mediant," because it's the chord built on the upper mediant and it involves raising pitches. "are there any equivalent symbols to describe these chords in the international music bibliography?" You're using Riemannian function labels, which should be understood by someone in academic music theory. But a non-academic in America almost certainly wouldn't recognize them. If you want a more universal system that others will understand, I would recommend using Roman numerals for most of these chords. The B major chord in m. 3, for instance, would be III♯, because it's built on scale-degree 3 (hence III), and the ♯ shows that you raise the chordal third to D♯, thus making it major. 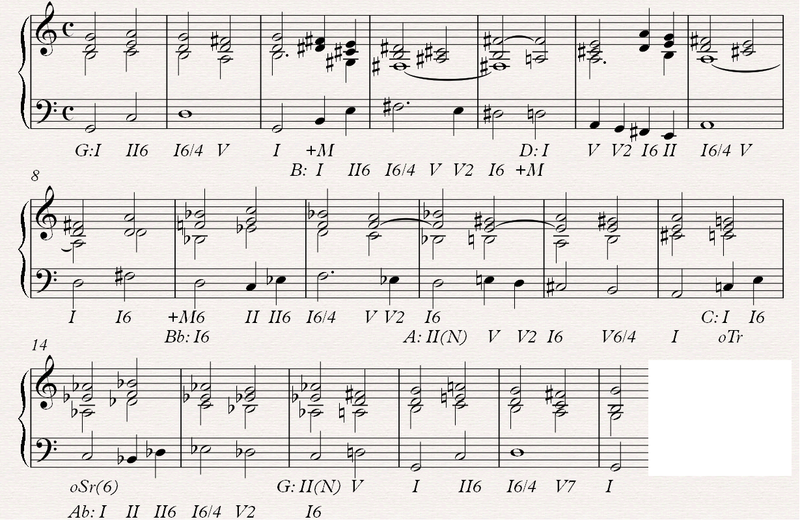 The B♭ chord in m. 9, since you're in D major, would be ♭VI6: ♭VI because it's built on the lowered scale-degree 6 in D, and 6 because it's in first inversion. Not the answer you're looking for? Browse other questions tagged theory harmony terminology chord-progressions modulation or ask your own question. In traditional (tonal) harmony, how is the word “sonority” used? Harmonic Motif vs Melodic Motif? Why does this harmony work? Can the idea of “modulation” be applied outside of harmony?